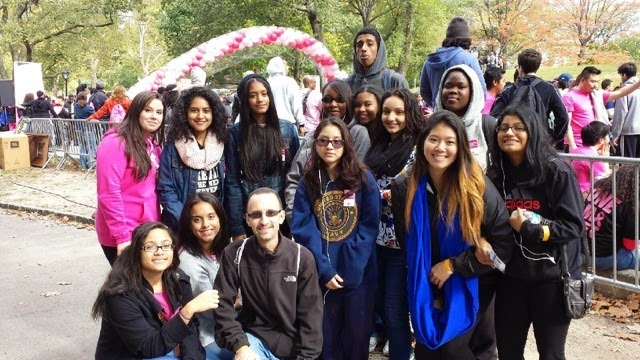 On Sunday, October 19, 2014, members of the HSVD Community Service Club participated in the Making Strides Against Breast Cancer walk at Central Park. Despite a seasonably cold weather forecast, it turned out to be a great day, weather wise and otherwise. We raised $148 that will go towards cancer research programs. Although we were separated into 2 groups during the 5 mile walk, we reunited at the finish line to take a few photos, which can be viewed in the Gallery section. We look forward to participating in many more service learning projects! HSVD participants included seniors Carolina Gonzalez (Club President), Anisha Cartagena, Selina Lopez, Jessica Martinez, Einasia Smith, Alexa Nunez, and Kimberly Jimenez, juniors Gabby Ogando, Marilyn Leal, Dimitri Adams, Karina Alvarez, Imani Johnson, and Arleyne Figueroa, along with teachers Ms. Chung, Ms. Siebhur, and Mr. Rau (Faculty Advisor). In addition, Ms. Siebhur’s brother and Ms. Chung’s sister and friend joined us. Well done HSVD!